In long-term pastures a grass and a legume are usually planted at the same time (except for leucaena, where the grass is established after the legume). These pasture types can be slower to establish but the grass and legume components are very persistent once established. Often the legume takes some time to increase in density but this is necessary for the pasture to remain productive in the longer term. Some leucaena pastures continue to be productive and persistent almost 40 years after planting. Two other tropical legumes with potential to survive in long-term pasture systems are Caatinga stylo and desmanthus. Well suited to clay and clay loam soils. More tolerant of cold than shrubby stylo or Caribbean stylo. Flowers early with prolific seeding. Seed is small and slippery if dehulled so should be planted at 1 to 2kg/ha on the soil surface. Requires a highly specific inoculum which should be mixed with seed prior to planting. Two cultivars are Unica and Primar. Unica is erect and flowers 2 to 4 weeks later than Primar in the establishment year. Primar is earlier flowering and has more tolerance to cool conditions but has been affected by anthracnose in seed production areas. Caatinga stylo is not highly palatable. Grazing stock generally prefer green grass leaf over legume leaf but as the grass matures the stylo is well eaten. Steer growth rates when grazing Caatinga stylo/grass pasture at a stocking rate of 1 weaner steer per 1.2ha over five seasons at Brian Pastures Research Station were generally higher than for steers grazing butterfly pea/grass pasture or grass without legume (see graph). Figure 1. 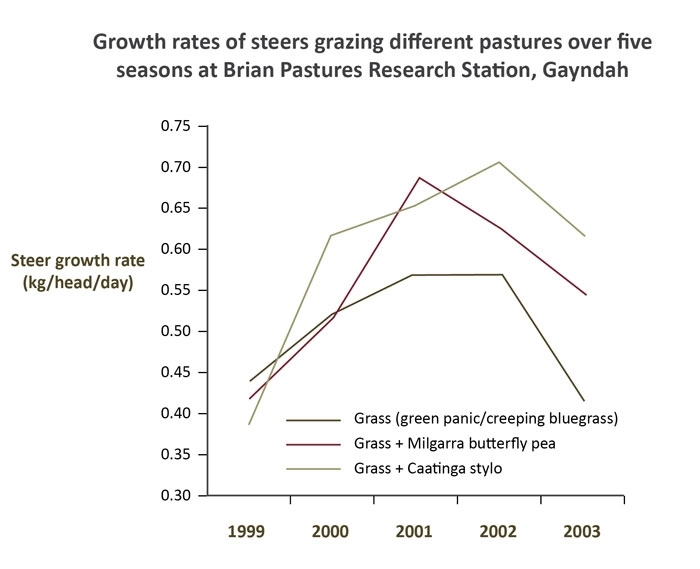 Growth rates (kg/head/day) of steers grazing grass (green panic and creeping bluegrass), grass with Milgarra butterfly pea or grass with Caatinga stylo pasture over five seasons at Brian Pastures Research Station, Gayndah. Small long-lived perennial shrub well suited to alkaline clay soils. Once established competes with aggressive grasses including buffel. Forage production is low but it is well eaten by stock when available. It also tends to shed leaf in response to dry conditions so its contribution to the pasture yield and animals’ diet is variable. Small seed that requires scarification before planting on or close to the soil surface at 1 to 2kg/ha. A heavy seed producer. Seeding occurs throughout the growing season but a high proportion of seed is hard. Field softening can take some years so a good initial strike is important, but plant density can increase rapidly once the seed has softened. Marc is the main cultivar. Growth rates for steers grazing desmanthus/grass pasture at Brian Pastures Research Station over six years ranged from 0.43 to 0.66kg/head/day. This compared with a range of 0.29 to 0.63kg/head/day on grass only pasture. Long-lived shrub or small tree that produces forage of high nutritive value for cattle. Grows best on fertile, well-drained, neutral to alkaline soils but can be slow to establish. Susceptible to frost. Light frosts affect the leaf and heavy frosts can kill the stems to ground level but usually will not kill mature plants. Usually grown in rows 6 to 10 metres apart. Needs to be planted into well-prepared cultivation with a full profile of soil moisture. Weed control during establishment is essential and the area should be kept weed free until the leucaena plants are well established (at least 1 to 1.5m tall), after which grass can be established between rows. Two cultivars most widely planted are Cunningham and Tarramba. Cunningham is a lower growing heavily branched type. Tarramba is more tree-like. Yields of edible forage are similar but Tarramba can establish more quickly and also recover more quickly from setbacks such as frost or insect attack. Both varieties are susceptible to attack by psyllids, small sap-sucking insects that feed on the new growing leaves and can reduce forage production, particularly in autumn and spring when conditions are cool and wet. Forage yields of leucaena in the lower rainfall (650 to 750mm) sub-tropical areas are low but the palatability and nutritive value of leucaena and the associated grass is high. As a result high animal growth rates of over 250kg/head/year (0.7 to 0.8kg/head/day) are regularly recorded. To maximise growth rates and to prevent toxicity from mimosine and its derivatives, an anaerobic rumen bacteria (‘rumen bug’) should be transferred to the rumen of all cattle grazing leucaena. This can usually be achieved by drenching about 10% of the animals in a group and allowing the bacteria to transfer to the rest of the group.